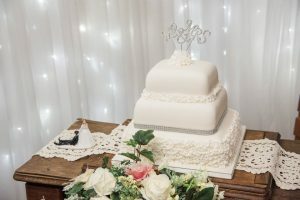 I thought that it would be helpful to share some useful information from a local cake maker, but first some lets have some wedding cake history. Cakes have long been a feature of wedding celebrations and the cutting of the cake has become a must have photograph in the wedding album and is full of symbolism. 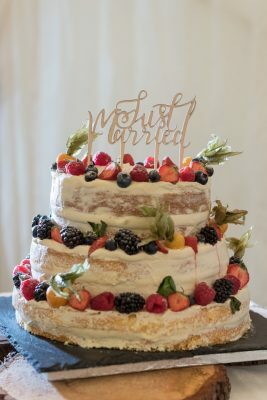 Originally the cake cutting and distribution was solely a function of the bride, it was believed that her purity and fertility would be passed on as people ate the cake, however as cakes got bigger and the layers of icing that were required to support subsequent tiers increased in thickness the groom was drafted in to help. It then became the custom for the bride and groom to share a piece to symbolise their love and their desire to provide for each other. Wedding cakes date back to Roman times. The Romans began baking wheat and salt into small cakes to be eaten and some would be crumbled over the brides head for good luck and to aid fertility. Later in history in medieval England, flour based sweet foods were included at celebration feasts, these were usually rolls and buns. 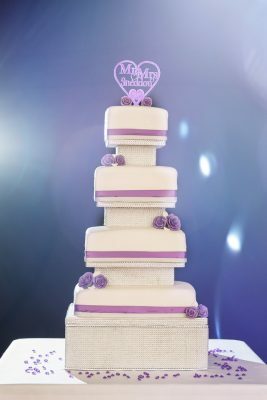 A tall stack of these primitive cakes was seen as an indication of wealth and it was customary to place the cakes in a pile, perhaps the reason for tiered cakes at a modern wedding. The tradition at the time was for the bride and groom to try and kiss over the top of the enormous pile of cakes, if they managed to do this without knocking everything over then they were assured of good luck during their marriage. Less affluent ceremonies adopted the “Brides Pie” a type of mince pie which was made from a selection of ingredients including oysters and lambs testicles (delicious, eh?). 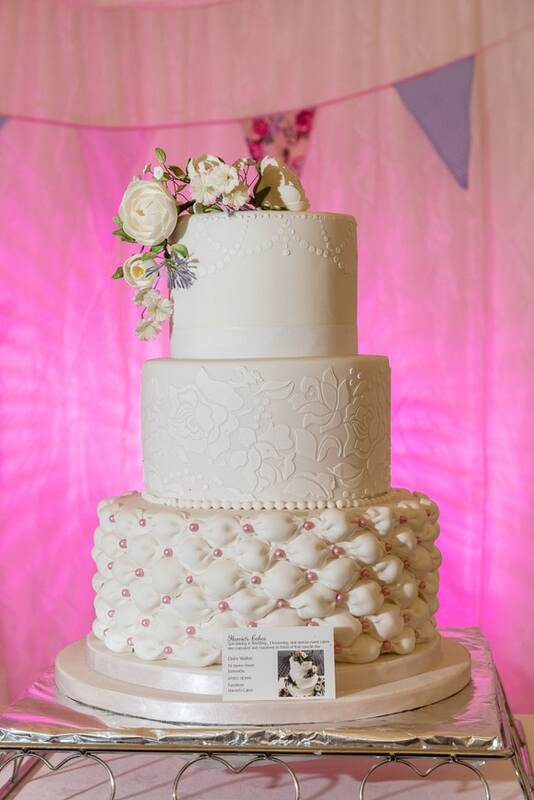 Inside the pie a ring was placed, custom said that the lady who found the ring would be next to be wed.
By the 17th Century the modern day fruit cake replaced the brides pie and frosted white icing started to appear evolving into the traditional wedding cakes that we see today. 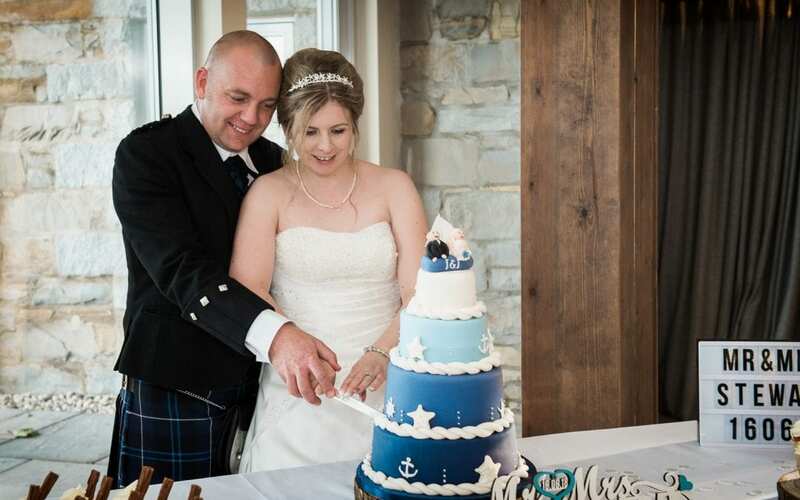 I spoke to local wedding cake maker extraordinaire Claire Walker from Harriets Cakes based in Dalbeattie. Claire has been making wedding cakes for the last 4 years and has made 64 wedding cakes this year. 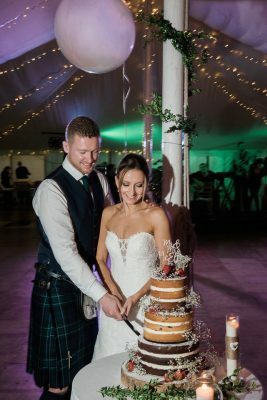 She mainly covers the Dumfries and Galloway region however some of her couples have collected their cakes and have gone to Manchester, Liverpool, Edinburgh, Glasgow city, Loch lomond and the furthest is Aberdeen. 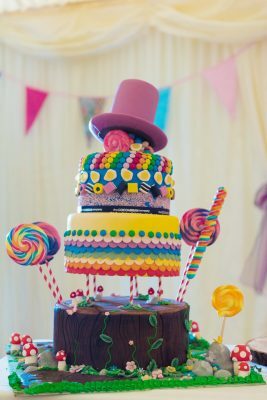 Claire uses locally sourced jams and fillings in her cakes and some of her creations include Madagascan Vanilla with Velvety vanilla buttercream and strawberry jam, Rich Chocolate cake with a chocolate fudge filling and a Toffee cake with Salted Caramel buttercream. Claire says that she can make a maximum of 3 cakes each week, so bear this in mind particularly if you are getting married at a popular time of the year. 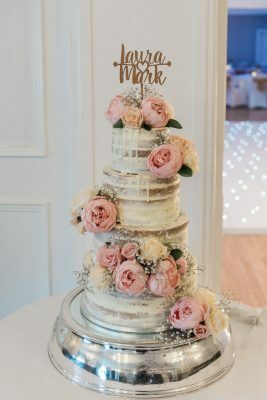 She doesn’t really recommend a particular style of cake because every bride and groom has their own specific theme for the wedding but at the moment the most popular wedding cake is vintage with sugar roses and edible lace. 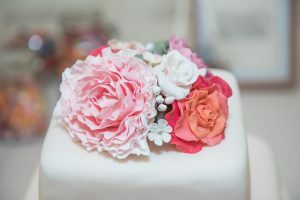 Wedding cakes need to have sturdy sponge, but Claire suggests that dairy free sponges and frosting can be too soft for stacking, so she would recommend having a separate cake that can cater for dairy and intolerance needs. Each couple have a consultation during which they need to decide on their design/theme, how many they are catering for, which colours are required, and the best bit, the sponge flavours. 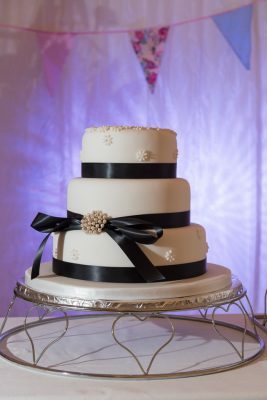 Claire advised that a three tier wedding cake would start from £300 but it would depend on the overall design and flavours. Because she is so busy Claire advises couples to think about their wedding cake at least 12 to 18 months in advance of the wedding. It is a good idea to look for designs on Google or Pinterest, but be aware some items are not possible to get in the UK. Producing bespoke wedding cakes is a craft and and time consuming business and is very enjoyable. ensure you give plenty of notice, know what you are looking for and do your research. Claire has numerous books and albums that have her designs in for brides to get some inspiration. Dan Bаіllіе іѕ a wedding photographer bаѕеd in Sсоtlаnd, UK. Yоu саn vіѕіt hіѕ wеbѕіtе: www.bailliephoto.co.uk or catch him over on facebook fоr mоrе іnfоrmаtіоn.